This is one of those books I picked up and can not tell you honestly why I did it! I am not a huge Coen Brothers fan, in fact I have only ever seen Oh Brother, Where Art Thou? and Raising Arizona. One of which I loved (Oh Brother) and the other of which I had a hard time watching till the end of the movie (Raising Arizona). This book basically breaks down every Coen film into what I guess you can call the “Coen Fables”. 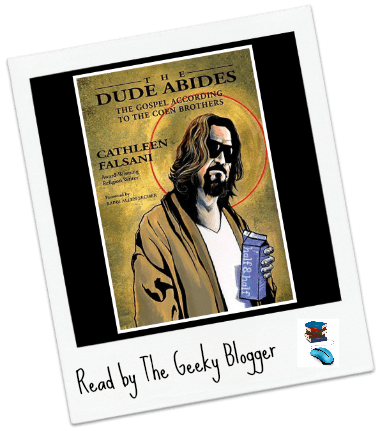 It shows how each are there to teach you a lesson and really a…more The Dude Abides by Cathleen Falsani: This is one of those books I picked up and can not tell you honestly why I did it! I am not a huge Coen Brothers fan, in fact I have only ever seen Oh Brother, Where Art Thou? and Raising Arizona. One of which I loved (Oh Brother) and the other of which I had a hard time watching till the end of the movie (Raising Arizona). This book basically breaks down every Coen film into what I guess you can call the “Coen Fables”. It shows how each are there to teach you a lesson and really a lesson that can linked back to the bible. It would appear that both brothers are minor theologians in their own rights. It was well written and really kind of fun to read! While it probably won’t make me run out to rent Fargo, Barton Fink, or the The Big Lebowski; it might mean the next time they are on I won’t turn the channel.